The Standard (Concord, North Carolina) November 13, 1890, p.3. We are glad to learn that Miss Genolia Miller, a pupil of Mt. Pleasant Female Seminary, and who has been seriously ill, is thought to be recovering. The Standard (Concord, North Carolina) November 20, 1890, p.3. With peculiar sadness the Standard chronicles the death of Miss Genolia Miller, a student of Mt. Pleasant Female Seminary. In death, there is sadness and sorrow; but in the death of Miss Miller, a bright, talented and promising gem just entering sweet womanhood, there is great sadness. Miss Miller has been sick for more than two weeks, and at one time she was thought to be improving, but on Friday night about 12 o’clock life disappeared and the gentle girl was wrapped in death’s cold arms. If we mistake not Miss Miller was a member of the senior class; she was a sister-in-law of the Principal, sister of the Rev. Chas. B. Miller, of the N. C. Lutheran Synod, and a granddaughter of Dr. Sifford, of Ebenezer section. In November of 1890, typhoid fever broke out at Mt. Pleasant Female Seminary (Mont Amoena). The Standard newspaper reported that student Genolia Miller, of Watsonville, Rowan County, had been seriously ill, but seemed to be recovering. Sadly, she died at the seminary sometime during the night of November 14 and was then buried at Holy Trinity Cemetery. Genolia was a twenty-two year old senior student and sister of the wife of Principal J. A. Linn. Genolia had inherited 61 acres of property from her deceased father, Charles R. Miller. For the next several years, nine family members, including J. A. Linn, sought claim of Genolia’s estate, which included the value of the land and $10 cash. 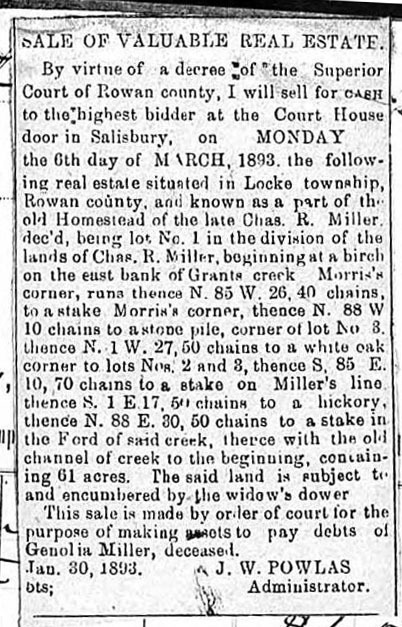 It was finally settled when the land was sold at auction on March 6, 1893 for $325.00 and all debts were paid.